The Epic A30T treadmill offers many of the same outstanding specs as the A35T and the A42T, but surfing the web on a black and white screen is the turn-off of this model. On the 7" high-definition black and white screen, you can view your workout stats including time, speed, distance, incline, pulse, calories, and heart rate. The screen tilts for better viewing and has an Android™ web browser built-in for full internet access. 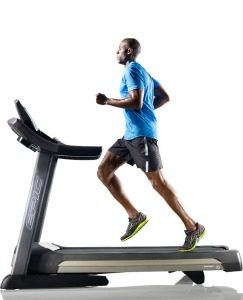 The Epic A30T treadmill is equipped with a runner’s motor of 3.0 continuous horsepower for dependable speeds. It has EnergyReturn cushioning on the deck to ease the strain on your joints and back. It also has a 20" x 60" 2-ply commercial tread belt, and 2.5-inch precision balanced rollers at both ends of the belt. Other key features include a 350-lb user weight capacity, a -3 degree and 15 degree Decline Incline feature to simulate both downhill and uphill terrain running, an iPod plug-in port with 2x3 speakers, a cooling fan, folding frame, and contact grip heart rate monitoring. The SafeZone technology on all Epic treadmills is an alert and auto shut-down feature that activates if a child or pet approach the moving treadmill belt from the rear of the machine. The Epic A30T comes with 30 pre-set program apps and 2 user-defined programs. The iFit Live has downloadable programs but this feature is entirely optional and you may decide not to use it. You can use the display simply to show your workout stats, or you can use the browser that gives you access to the world wide web (via your home’s wireless network set-up). There aren’t many user reviews on this model, but we can tell you that it is certainly well-built and has a ton of cool features. 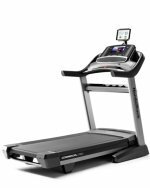 However, if you are looking for a web browser compatible treadmill, look to Proform and NordicTrack to have models at about the same price as this one but with color monitors. The Epic A30T treadmill at $1,999 is about $500 less than the A35T with the color touch screen, the next model in the line-up. Both Epics are built on the same frame although the A35T has a bigger motor, more programs, and a better warranty. The downside to this model is the black and white browser – sort of like going back to black and white TV, isn’t it?